CIDT’s MfDR approach focuses on improving organisational performance and meeting internal objectives while, at the same time, ensuring that the work the organisations do is effective, efficient and has a meaningful impact on the external beneficiaries. “MfDR is an effort to respond to the growing demand for public accountability in both the developed and developing worlds on how assistance is used, what results are achieved and how appropriate these results are in bringing about desired changes in human development. An MfDR approach encourages development agencies to focus on building partnerships and collaboration and ensure greater coherence. Similarly, it promotes stronger focus on sustain­ability through measures that enhance national ownership and capacity development. MfDR is a term and concept that is widely known and endorsed among intentional development agencies and governments. The concept initially became globally recognized at the International Conference on Financing for Development in Mexico in 2002, where the international community collectively acknowledged the need to measure results throughout the development process, as well as the need to demonstrate that results were achieved. Soon afterward, the World Bank convened a first and second International Roundtable on Measuring, Monitoring, and Managing for Results (in 2002 and 2004), at which development practitioners grappled with concepts, approaches, and practical issues related to MfDR and agreed upon a set of core principles. Then at the Paris High-Level Forum on Aid Effectiveness (2005), 60 partner countries and 60 donor agencies endorsed the Paris Declaration, committing to specific action to further country ownership, harmonization, alignment, managing for development results, and mutual accountability for the use of aid. In 2008, at the Third High Level Forum on Aid Effectiveness in Ghana, an even higher level of engagement helped bring about the Accra Agenda for Action, which expressed the international community’s commitment to further increase aid effectiveness. As shown in the diagram, MfDR and RBM require a life-cycle approach, starting with elements of planning, such as setting the vision and defining the results framework; then conducting monitoring, review and evaluation as appropriate during the implementation stage; and using the valuation information from M&E to inform decision-making and lesson learning in both the current and future initiatives. This is why the Programme and Project Cycle Management (PPCM) model is also very closely associated with MfDR/RBM. 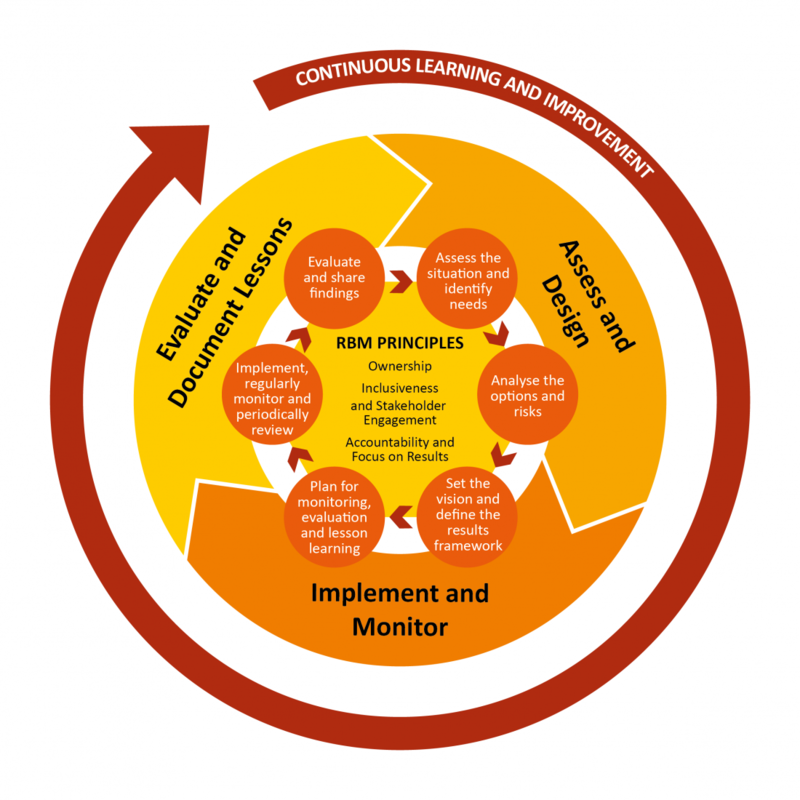 The Logical Framework Approach (LFA) is a well-known RBM tool, which facilitates PPCM and, in particular, the development of clear results frameworks – often in the form of Logical Frameworks – that are absolutely essential for applying MfDR to projects, programmes and even organisational development institutional capacity strengthening. In fact, MfDR is typically characterized by LogFrames in which desired results (i.e. impact, outcome, outputs) are defined, activities are identified, SMART performance indicators are elaborated, and assumptions underlying the Theory of Change are stated. These frameworks serve as the basis for on-going management, monitoring and evaluation (M&E), and documentation of lessons learnt for the given project, programme or institutional strategic plan or performance monitoring plan (PMP). Finally, Results-Based Funding (RBF) or Performance-Based Financing (PBF)4 is an longstanding yet continually evolving initiative for promoting MfDR in budgeting, and an obvious push factor for building capacity to manage for results. RBF implies that “a funder is willing to make payments to an agent who assumes responsibility for achieving pre-defined results. Results-based funding aims to increase accountability by creating a more direct link between aid and results, improve partner country ownership of results, and create incentives to increase effectiveness. Several donors, including multilateral and bilateral agencies as well as foundations, are piloting or scaling up results-based funding modalities. Others are providing support to these modalities through multilateral banks or trust funds. Results-based funding interventions highlight the need to understand the role of financial and non-financial incentives and the potential spill-over effects of the instrument on governance”5. The notion of Value for Money (VfM) is very much related to this and MfDR in general, as it is all about finding efficiencies and ensuring an adequate balance between inputs and outputs (or results!). Also called payment by results, results-oriented budgeting, budgeting by results, etc.